By now, Y'all are quite tired of reading about your humble No Fenders scribe recent trek to thou B-I-G' Islands 'O Hawaii. As naturally travelin' via B-I-G 'Ol Jetliners lingers on thine mind. I marveled at how his trek Down Under ended in Perth, after having gotten horrifically sunburned when attempting walking to Freemantle; CRIKEYS! As Bryson notes, it's 4,000 kilometers from Sydney, 5,000 from Brisbane and 4,000 actual driving kilometers from Alice Springs; did I get that correct Mates? With NO idea how far it's to Melbourne. And as he explains to presumably another Ugly American traveler, who complains to her husband 'bout traveling across an entire continent to stare at some ugly rocks. Bryson politely tries explaining their amazing qualities and that she's standing at the only place where one can see such treasured gems so easily accessible in the world, and she retorts: you've got a very nasty sunburn! Naturally Bryson's tome put me in the spirit of travel and also peaked; NO Danica Jokes here; Hooah! 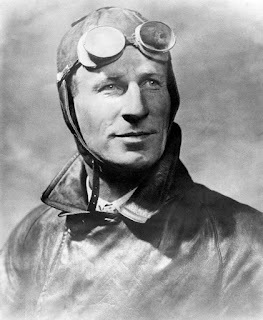 My curiosity about an unknown aviator named Charles Kingsford Smith, who seems to live in the total shadow of some chap named Lindbergh. As I found myself way more intrigued over Bryson's stumbling into the remains of the Kookaburra accidently on a day's Walkabout of Alice Springs tourist attractions solo, bungling into a totally obscure, nondescript building with its door slightly ajar. Oh Yeah, it's a-L-L coming back to Mwah over Bryson's most unflattering description of Alice Springs lack of caring towards tourists, from the Hotel's being named incorrectly to the snobby Desk Jockey Clerks, etc; albeit that was Wayback in 2000, so you'd like to ARSE-Sume it's improved since then, eh? As just the "Back story" alone about the fate of the Kookaburra is most interesting itself, but I was more intrigued over the lost aviator the two doomed pilots had set out to look for on their fateful flight. As I'd never heard of Sir Charles Kingsford Smith before, who's truly an aviation pioneer who seems largely relegated to obscurity here Stateside; Sigh! As I'm having trouble finding much of substance upon the lauded Aussie pilot fondly known as Smithie', although I did run across this brief story 'bout a damaged wooden propeller from one of the 'Ol Bus's flights in 1935, in which Y'all should really check out the gallantry of navigator Gordon Taylor who climbed out on the wing six times to scavenge oil for their remaining overheating Ford motor! As this famous Fokker tri-motor Aeroplane was subsequently donated after it's failed King George Silver Jubilee Mail Delivery flight headed for New Zealand, shortly prior to Kingsford Smith's disappearance. Alas, this new found curiosity over the forlorned Aussie aviator naturally turned my radar onto other aviation stories, as Bingo! Up popped an article from Air & Space Museum's online magazine, regaling another once unthinkable flight. Whilst the father of true modern day transcontinental flight, made seemingly ordinary with the creation of the Boeing 747, giving our local Aerospace company a true leg up upon its competition just passed away recently. And lastly, since you're probably saying this isn't very Open Wheel Racing related, if you've stuck with me this far, albeit Australia and New Zealand do rightly hold their place in both Formula 1 and IndyCar racing! As just think of such luminaries as Jack Brabham, Bruce McLaren, Alan Jones, Denny Hulme, Scott Dixon, Will Power and Chris Amon for starters. Barbershop Pic' - Prowlin' Ants! Barbershop Pic' - Greenery' abounds..
Barbershop Pic' - They're Off! INDYCAR: When's a McLaren Not a McLaren?